The National Commission for Culture & the Arts (NCCA), in celebration of the ASEAN 50, presents Tingin ASEAN Film Festival. 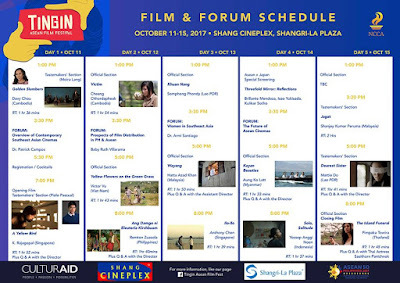 This event will showcase films from all over Southeast Asia at the Shang Cineplex, Shangri-la Plaza in Mandaluyong City (Metro Manila, Philippines) from October 11 to 15, 2017. Admission is FREE. With the theme, "Southeast Asia through the Eyes of Cinema," the film festival hopes to draw a composite picture of modern Southeast Asia by bringing together representative films from all over the ASEAN region. 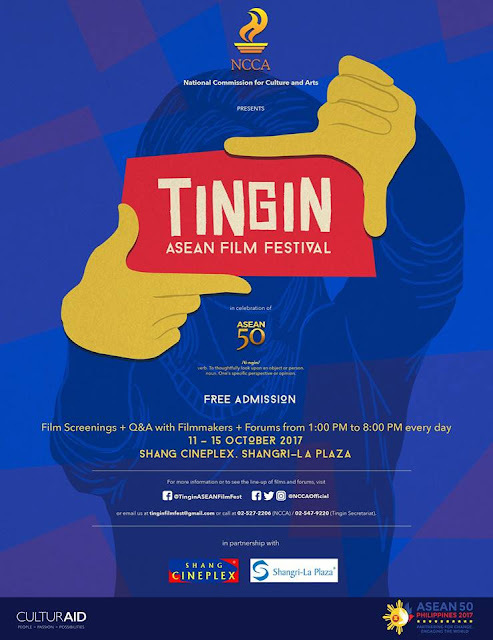 Tingin includes exemplary Asean movies like Kayan Beauties (Myanmar), A Yellow Bird (Singapore), Ilo-Ilo (Singapore), Golden Slumbers (Cambodia), Ang Damgo ni Eleuteria Kirchbaum (Philippines), Dearest Sister (Lao PDR), among others. For October 15 (Sunday) at 1:00pm, featured film will be: Sapami Abdullah’s Waris (Brunei). It will be followed by Q & A with the producer Noor Alimin bin Haji Garip. Tingin will also include daily forums with film luminaries like Dr. Patrick Campos (UP) on an overview of contemporary Southeast Asian cinema, and Baby Ruth Villarama on "The Prospects of Film Distribution the Philippine and the Asean region." TINGIN is being held in commemoration of the 50th Anniversary of the Philippines’ membership to the Asean and the Philippine chairmanship of Asean in 2017.